This artificial archipelago was supposed to resemble a map of the world. 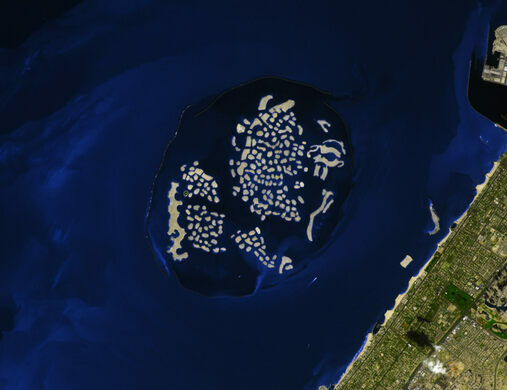 Dubai is famous for its luxurious Palm Islands, the easily recognizable manmade archipelago off of the city’s coast. 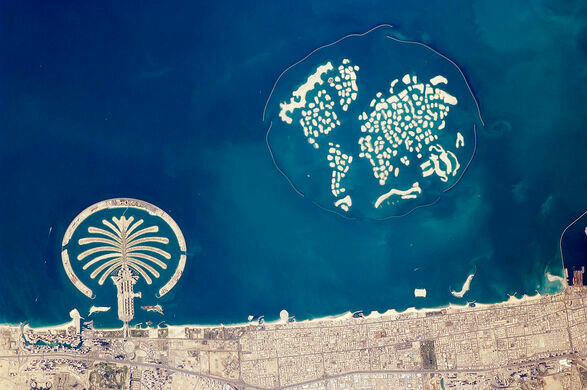 Based on the Palm’s success, Dubai’s ruler, Sheikh Maktoum, envisioned an even bolder archipelago project in 2003: a group of islands shaped like a map of the world. 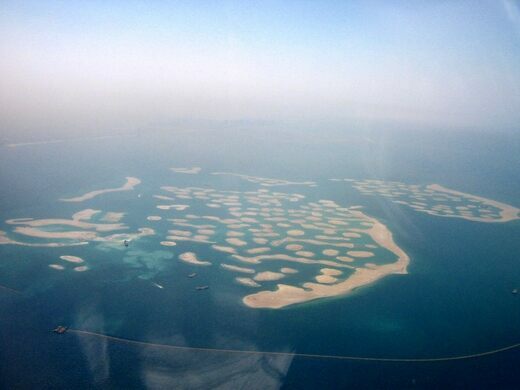 Unlike the Palm Islands, however, it seems the World Islands may have been a disaster of global proportions. A faithful reproduction of Al-Jazari's enormous water clock. Billed as the "largest natural flower garden in the world" this Middle Eastern show field has little competition at 45 million flowers. This indoor ski resort has a mountain contained inside a mall. Construction of the World Islands began in September of 2003. Requiring 321 million cubic meters of sand—about the volume of 150 Major League Baseball stadiums, up to the top of the foul poles and including the stands—the World Islands cost over $14 billion to build. With one island for every country (excluding Israel), the World Islands together covered over 20 square miles of the Persian Gulf. 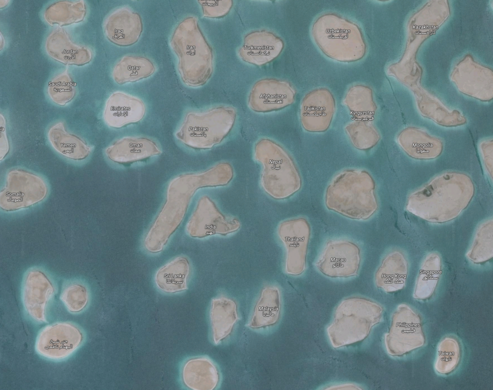 Located just three miles off the coast of Dubai, the 300 islands that made up the World Islands are supposed to resemble a world map when viewed from above. Unfortunately for the islands’ developers, the archipelago turned out to be only vaguely recognizable. Due to weathering, sinking, and erosion, the World Islands have lost their well-defined borders. Central America is practically nonexistent, Australia is awkwardly made up of five rectangular strips of sand, and Europe, Africa, and Asia have merged into a largely indistinguishable blob. 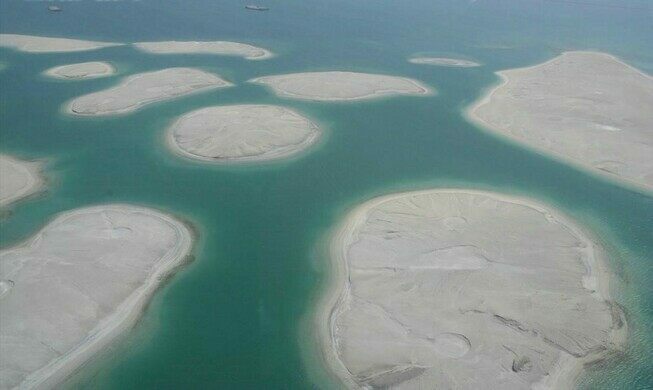 In addition to the aesthetic problem, the World Islands don’t have a reliable source of electricity, as the plan to install electric cables under the Persian Gulf has fallen flat. For these reasons, 291 of the 300 World Islands have been left undeveloped and to this day remain nothing but sand. Even though 60% of the islands were sold to private companies and investors by 2008, after eight years nearly all have remained untouched. 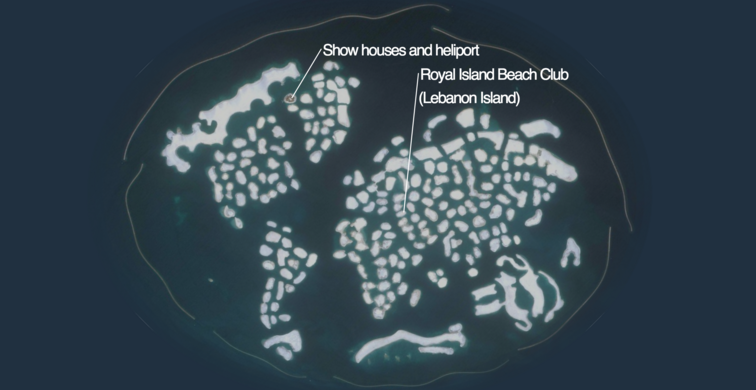 As of 2016, only nine of the islands have been developed: Lebanon Island, Pete’s Island, the six islands making up the “Heart of Europe” resort, and Island Michael Schumacher (named after the seven-time Formula One World Champion). The entire continents of Africa, Asia, Australia, and South America remain entirely uninhabited blotches of sand. Sign up for our newsletter and get the best of Atlas Obscura in your inbox. Start the discussion. forum Visit our forums. to Iran, Scotland, Galapagos, and more. A preposterously luxurious hotel with gold-plated iPads, Rolls Royce chauffeurs, and a staff that trains by watching "Downton Abbey." The world's largest frame offers spectacular views of the city's past and present. On any given day this sprawling market houses literally tons of government-regulated gold, gems, and precious metals. The abandoned ruins of a failed resort hide on this verdant, picture-perfect island. The eclectic seaside sanctuary caters to a rather fowl crowd. Former military fort and site of untold horrors during WWII, this island may become the Adriatic's next luxury resort. A former factory serves as a shrine to the industry that sustained Santorini for decades.